I got a Harrods voucher as a birthday present from my friends. I have quite mixed feelings about vouchers but I must say that this one made a very interesting day for two. I mean, seriously, how often does someone give you a generous sum of money and tells you to just ‘knock yourself out at Harrods’? Exactly! So we (we consist of my girlfriend and me) took the bus to London town and entered the modest store with green awnings. We heard people speaking about dress codes so Sunday’s finest it was (well, not really, but it does sound much better this way). There’s kind of a rule of natural selection in Harrods. If the item isn’t displayed with a price tag and you would really like to know how much it costs, you’re probably not their target customer. So we successfully passed the priceless perfumes, fought our way through all the underdressed tourists – turned out the dress code thing isn’t as strict as promoted – and escalated to the basement. It’s Harrods, you don’t use the stairs. Pff. Ah, the wine basement. Another gift I got for my change of decade, this time from my girlfriend, was a course in wine tasting which resulted in me passing the WSET level 1 in award in wines, making me an official wine snob. And the Harrods wine cellar? Ever took a child to a huge Lego store? I think the fact that the guys selling wines down there are only French and Italian isn’t really a coincidence. Of course you will try the 2010 Châteauneuf-du-Pape when presented to you with a polished French accent. I asked Pierre – I have know idea what his actual name was – about a decanter I saw on their web store that seemed to be really nice. And, well, affordable. After a minute Pierre came back from the counter, masterfully curving through the wine shelves like Alain Prost on sedatives with one hand juust slightly extended. I should’ve known what he meant with ‘spicy’. The meaning of spicy became clearer and clearer as we were approaching the closed glass room. The bottle was right on the top. The decanter was nice but the bottle… Let’s just say it wouldn’t go well with that night’s dinner. So I took a walk around the cellar and took two bottles £8 each. Yes, there are cheaper bottles of wine in Harrods. And quite a big selection as well. And dare I say that an 8 pound bottle from Harrods is a better value than a same priced bottle from Tesco. And they don’t charge you for the bag. It would look a bit silly if they would ask for additional 5p after they slid £900 of your account to be honest. Two bottles and an opener later we were strolling through the Harrods market. An over-priced raspberry cheesecake? You do takeaways? Why thank you very much! An escalator higher and you’re wandering through designer clothes. Designed exclusively for Harrods. A champagne bar in the embrace of lavish evening dresses? Why not. She had champagne and I had, as a man does in the poshest place in Britain, a lager. 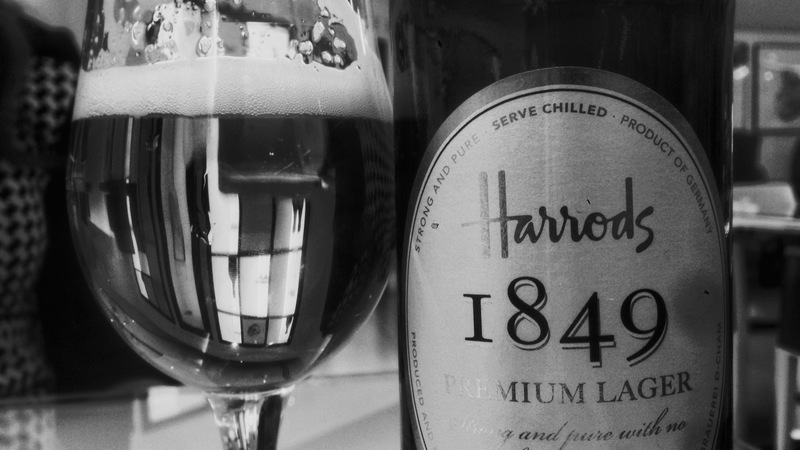 A Harrods lager to be precise. Not so bad. Not overly excited either. If you opened an encyclopedia at the word ‘lager’, this bottle would appear. It was around noon and neither of us had a serious meal so the rest of the Harrods experience was a bit mellow and, well, surprisingly soothing. Walking through those wide corridors full of overly posh and luxurious furniture, 80″ TV screens with no price tags, the massive toys section, endless lines of clothes and the always-smiling-always-ready-to-serve staff with alcohol cozily bubbling your brains it feels like you’re floating in some other world. And right at the very top of this Egyptian tower of Babel you find yourself overwhelmed by the poshest of them all. Perfumes. Five small rooms with neatly dressed and perfectly combed fragile foreigners mixing your perfect odors. We were completely ignored while walking past them. Even the two Harrods shopping bags didn’t fool them. Or maybe that’s what gave us away. The two Muslim ladies in front of us however… Talking about attention. The guys up there know their business and I bet there was something about the quality of those ladies’ hijab that made them all tingle and twitch when they passed, jumping in front of them like frogs over damp road. Much to our pleasure they ignored them all. We strolled through the purses area, played with the new Apple toys, glanced at unreasonably expensive watches and finished our poshy trip with just sweet enough raspberry cheesecake in Grosvenor Gardens. The decanter was still available online when we came home so I managed to squeeze my voucher to the last penny. After later research I found out the decanter was even cheaper then elsewhere. And it came packed as if containing a nuclear device. Yes, Harrods is a posh place and they do sell stuff that is completely out of this world. Basically they sell stuff no one really needs for way too much money. But they also sell normal priced stuff. They have an Apple store with normal Apple prices (if one considers those prices normal that is). They have a whole floor of toys with one of the biggest selections of Lego. For normal prices. They have a huge electronics floor with all the latest cameras, gadgets and TV’s. Consider it an electronics shop with a wider range. Whereas your local electronics dealer would limit his offer to a higher-middle class range, Harrods wouldn’t limit it at all. A £20.000 Samsung LED screen? Sure thing. Hand made wooden headphones with golden wires? Well why don’t you try them right away? And as strange as it may sound, I might go back there every now and again. Where else would I get such a huge selection of things with that level of service. And it’s not that I get a kick out of being treated as a diva. It’s just that the staff take time for you and they really know their area. So if you happen to be in London and have an hour or two to spend, maybe go to Harrods. If nothing else just to see this other part of the scale. And if you have any acting skills you might also get a free coffee. Just make sure you appear really interested in those coffee machines. Next Post I’m not a snob. I’m just 30.